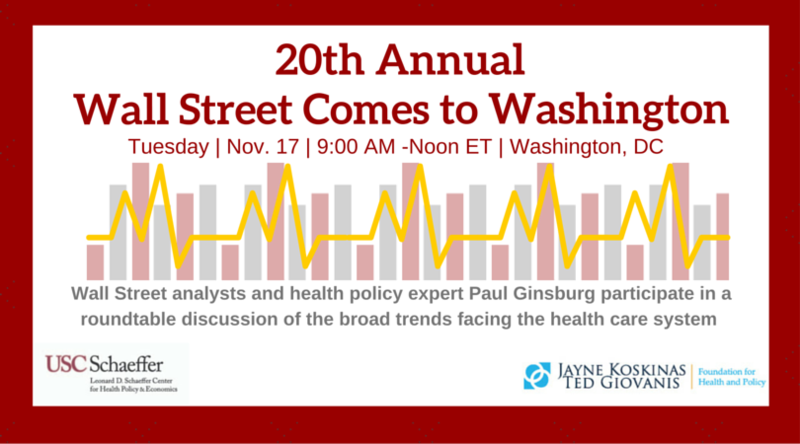 Wall Street analysts and Washington policy expert Paul Ginsburg of the Leonard D. Schaeffer Center for Health Policy & Economics at the University of Southern California (USC) will explore what the latest market developments mean for national health policy and how the political climate will affect the outlook for health care companies, including health plans and hospitals. Panelists will discuss the broad trends shaping the health care system, including an assessment of ongoing health reform implementation; open enrollment in the health insurance marketplaces; the growing Medicaid managed care market; regulation of insurance markets; insurance market consolidation; provider payment reform and integrating care delivery; underlying health care spending and insurance premium trends; hospital pricing and consolidation; hospital-physician relations; the outlook for Medicare; and other issues. WHAT: USC Schaeffer Center 20th annual Wall Street Comes to Washington roundtable sponsored by the The Jayne Koskinas Ted Giovanis Foundation for Health and Policy (JKTG Foundation). WHEN: Tuesday, Nov. 17, 2015, 9 a.m. to noon. Continental breakfast at 8:30 a.m.
WHO: Paul B. Ginsburg, Ph.D., USC; Matthew Borsch, Goldman Sachs; James LeBuhn, Fitch Ratings; Ana Gupte, Ph.D., Leerink Partners; and Sheryl Skolnick, Ph.D., Mizuho Securities USA. WHY: By bridging the worlds of Wall Street and Washington, the USC Schaeffer Center strives to provide a better understanding of how health care markets work and what changes in the health care system mean for people and policy. The mission of the Leonard D. Schaeffer Center for Health Policy and Economics is to measurably improve value in health through: evidence-based policy solutions, research excellence, transformative education, and private and public sector engagement. The Schaeffer Center is the result of a unique collaboration between the University of Southern California Sol Price School of Public Policy and School of Pharmacy. The Jayne Koskinas Ted Giovanis Foundation for Health and Policy (JKTG Foundation) aims to change health care for the better. Funding innovative medical research, data analysis, events and other projects, the Foundation serves as an honest, independent broker of ideas and actions designed to advance both health care and health policy. Visit www.jktgfoundation.org to learn more.